If you have always wanted to participate in a 5K for a great cause, now is your chance! Since 2002, Chicano Student Programs has organized this exciting annual spring quarter event as a way to further César E. Chávez’ inspirational message of service. Funds raised during the event help create scholarships for UCR students. This year’s César E. Chávez 5K Run/Walk will take place during spring quarter. Stay tuned for more details including registration and pledge deadlines, as well as an exact race date and time. 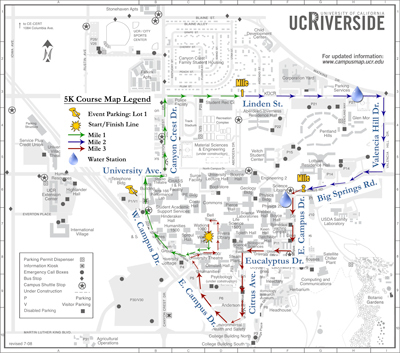 The César E. Chávez 5k Run/Walk course allows all participants to tour UCR’s beautiful campus while getting a great workout. You can print out a course map here. Overall, the course has three good-sized uphill climbs of varying degrees and three equally good-sized downhill slopes, as well. The start/finish line will be near Watkins Hall and the Rivera Lawn. The course will be chalked throughout campus with a lead biker in front. Miles one and two will be chalked and marked with signage. The one-mile marker will be right after Aberdeen Drive. The two-mile marker will be on Big Springs Road, just before East Campus Drive. There will be two water stations on the course. The first water station will be at the end of Linden Street by the Pentland Hills residence hall. The second water station will be located on the corner of Big Springs Road and East Campus Drive, in front of the science library. The Kids’ 1K Run will consist of two laps around the Rivera Lawn and the Bell Tower. Every child that crosses the finish line will receive a medal. There will also be a fun and educational Community Service Fair during the event. It will feature vendors, information booths, music and fun activities for the entire family. All individuals who turn in $30 or more in pledges, or teams that turn in $150 or more, will have their registration fees waived and receive an official T-shirt and commemorative token. The top individual and team pledge solicitors will be awarded special prizes. There are challenges announced for residence hall teams or issued to students and campus departments by the vice chancellor. Stay tuned for this year’s fun challenges! Sign up as an individual or participate as a team. Set a fundraising goal and ask your friends, family and coworkers to sponsor you; they can pay as they pledge. If they pay by check or money order, please make sure it is made payable to the Chicano Educational & Cultural Fund, Inc.
We invite you to sponsor this great event. There are multiple levels of sponsorship and each provides unique ways to showcase your business while supporting a worthy cause. If you are interested in sponsoring this year’s César E. Chávez 5k Run/Walk, please print out a sponsorship form below, or contact Chicano Student Programs. Thank you for your support.